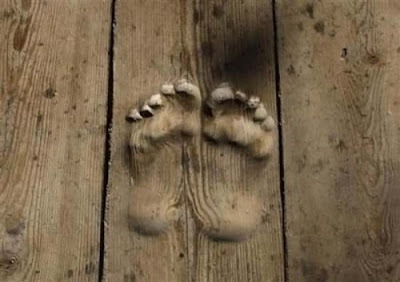 No, this isn’t some fancy Photoshop trick, these are real human footprints ingrained in a hardwood floor. 70 year-old Buddhist monk Hua Chi has been praying in the same spot at his temple in Tongren, China for over 20 years. 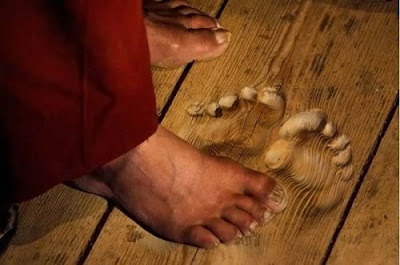 His footprints, which are up to 1.2 inches deep in some areas, are the result of performing his prayers up to 3000 times a day. Now that he is 70, he says that he has greatly reduced his quantity of prayers to 1,000 times each day. The footprints have become a source of inspiration to younger monks at the temple. 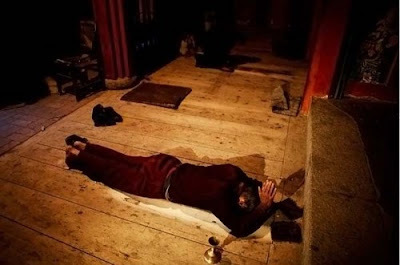 “Every day I come here and every day I look at the piece of wood, and it has inspired me to continue to make the footprints myself,” Genden Darji, a 29 year-old monk in the monastery, notes. OH my soul. This is just so sad that he has wasted all these years pryaing to a false God that has never, and will never answer even one of those vain prayers. OH! How these people need Jesus! We must tell them brother. God Bless You. And I am sure it breaks the Lord’s.